Any one who knows me, knows of my love of vampires. A fan of Anne Rice's oeuvre, when I met the Mayfair witches for the first time I was equally enamored. Unfortunately, writers who choose to relate tales of vampires and witches rarely have any real insight into this alternate reality, and scarcely do they advance the genre. Truth be told, the last few years have yielded some very interesting vampire literature, despite the sparkly vegetarians of teen fiction. Justin Cronin's The Passage was a wonderful modern re-imagining of the vampire origin myth, and Elizabeth Kostova brilliantly continues Bram Stoker's tale in The Historian. Both not only bring something new to the vampire genre, but their writing is as strong as the story-telling. Finally, the world of witches may have found a narrator to succeed Anne Rice in her retirement from the occult. In A Discovery of Witches Deborah Harkness asks a simple but worthy question: What would the world be like if it were filled witches and vampires and daemons? The simple answer is, we could easily be living in that very world right now. Harkness chooses of her book the perfect place that could easily be inhabited by otherworldly creatures, Oxford. Dr. Diana Bishop is an American scholar from Yale doing research on alchemy. A descendant of Bridget Bishop, the witch who died at Salem during the witchcraft trials, Diana is a reluctant witch who avoids her powers. When she discovers a magical manuscript in the midst of her research, she is forced to confront not only her own magic, but the magical world and all its denizens, who appear out of no where in search of the long lost manuscript. Along the way, Diana will come face-to-face with Matthew Clairmont, a vampire born in the time of Clovis, and she will learn that there is much she does not know about herself, her people, or the strange world to which she belongs. "The vampire who entered the salon was not the Matthew that I knew. He was not the elegant, charming creature who had slipped into my life with a mocking smile and invitations to breakfast. Nor was he the scientist, absorbed in his work and preoccupied with the question of why he was here. [...] This Matthew was cold and impassive. The few soft edges he'd once possessed—around his mouth, in the delicacy of his hands, the stillness of his eyes—had been replaced by hard lines and angles. He seemed older than I remembered, a combination of weariness and careful remove reflecting every moment of his nearly fifteen hundred years of age." 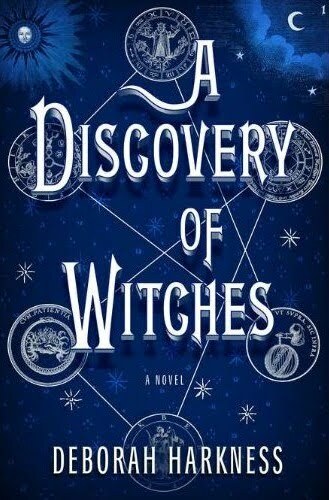 There is so much to love about A Discovery of Witches, not least the fact that no matter who the reader, they are bound to learn something new. A literary novel intended for those who just love to read, it is also a gift to all of us who love to imagine a world filled with otherworldly creatures. When I neared the end of the book and realized this was just book one of a trilogy, I was filled with both exasperation and excitement. I hated that I didn't know how things were ending, but I was thrilled to know there are two more worthy tomes on the way. Thanks, this book has been staring at me from the shelves for awhile. Now I have permission. Excellent review. The only question left for me is Audible download or Kindle/iPad ebook.